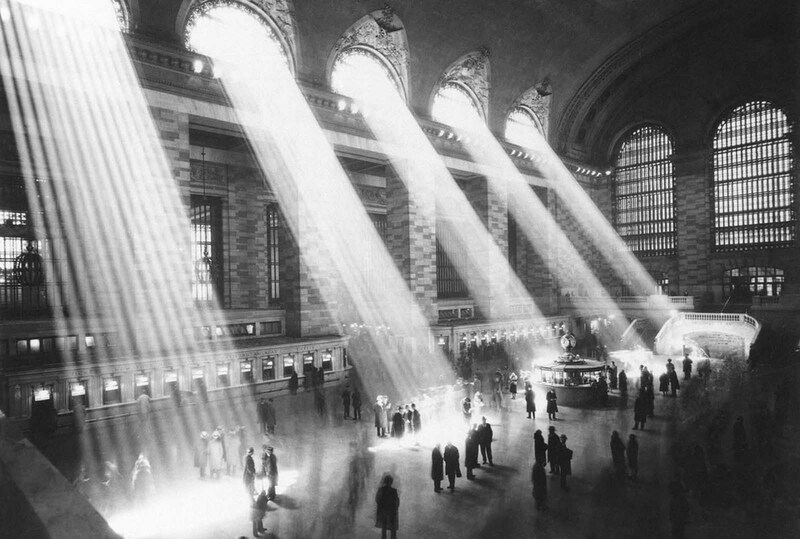 Sunlight streams through the windows in the concourse at Grand Central Terminal in New York City in 1954. New York Central’s breathtaking Grand Central Terminal (or GCT) is a New York City landmark and world-famous station. It was built during the Golden Age of rail travel and exemplified the power and scope railroads wielded at that time. While the terminal was a masterpiece of architecture and engineering, described as a gift to New York and a monument to the New York Central, it also had a very functional purpose. Its development sprang up from a need to meet the rising demand of rail service during a time when no other mode of transportation could provide such fast and efficient service. As Brian Solomon notes in his book, “Railway Depots, Stations & Terminals”, GCT was built with the future in mind, designed to handle much more traffic than that which existed at the time it opened. The history of rail service into downtown Manhattan can be traced well back into the 19th century. 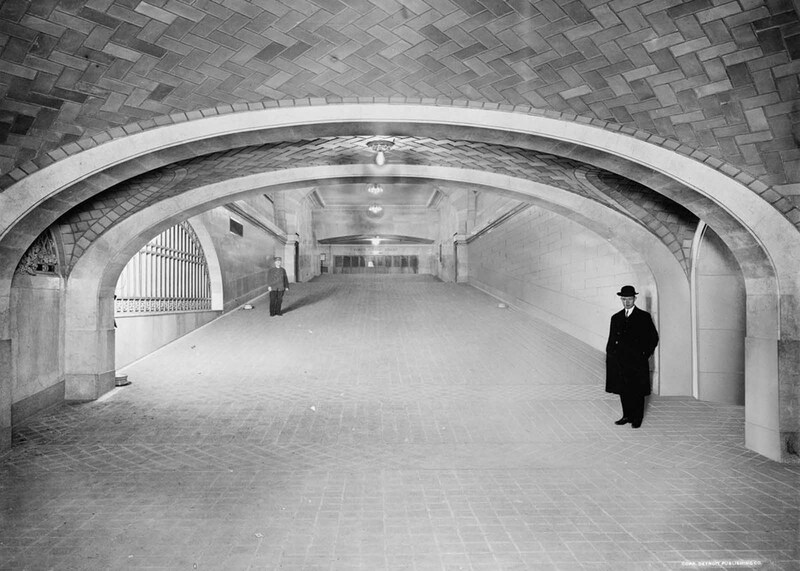 However, the current terminal was not completed until just prior to World War I. As the traveling public abandoned trains for other modes of transportation in the post-World War II era the magnificent structure was in danger of being demolished. 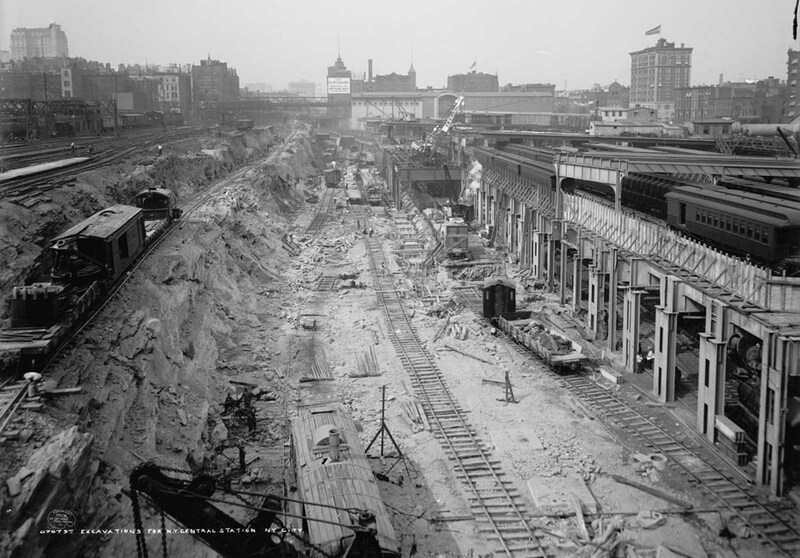 Excavation work at the site of Grand Central Station in New York City, in 1908. The first Grand Central Terminal was built in 1871 by shipping and railroad magnate Cornelius Vanderbilt. However, the original Grand Central soon became obsolete when steam locomotives were banned after a catastrophic train collision in 1902 that killed 17 and injured 38. Within months, plans were underway to demolish the existing station and build a new terminal for electric trains. 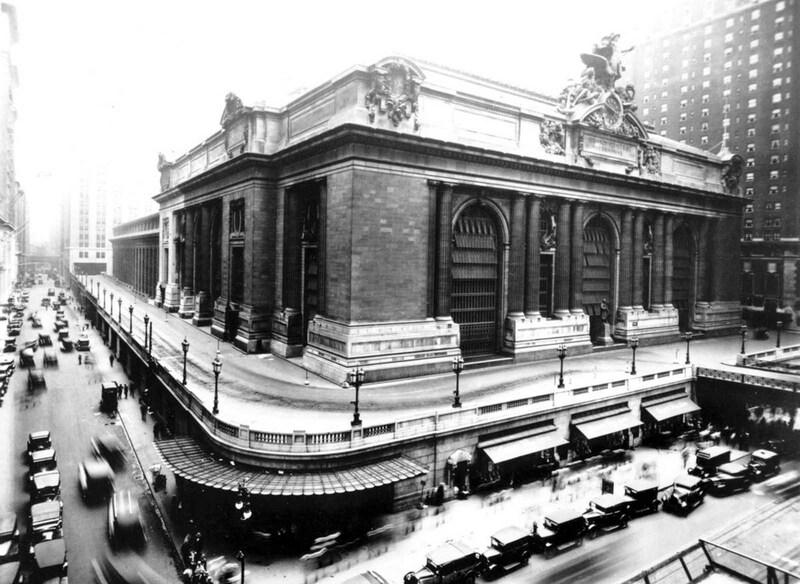 The new Grand Central Terminal officially opened on February 2, 1913. More than 150,000 people turned out to celebrate opening day. The beautiful Beaux Arts building with its massive marble staircase, 75-foot windows, and star-studded ceiling was an immediate hit. Hotels, office buildings, and skyscrapers soon sprang up around the new terminal, including the iconic 77-story Chrysler Building. 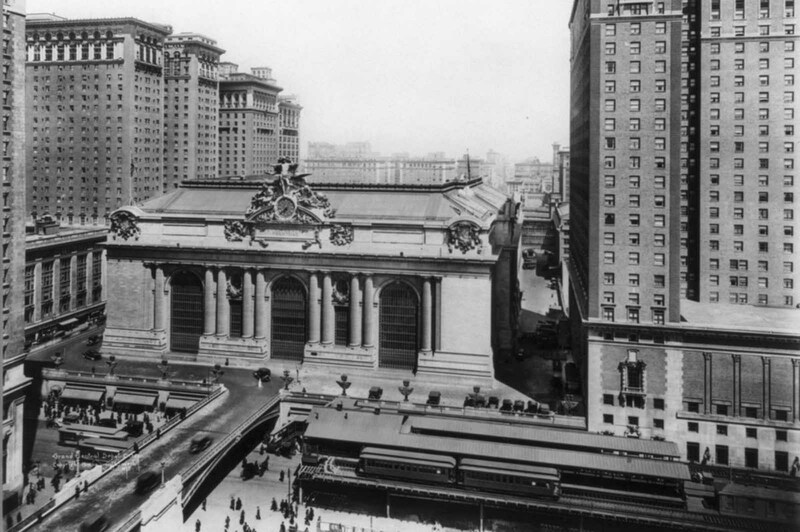 The neighborhood prospered as Grand Central Terminal became the busiest train station in the country. 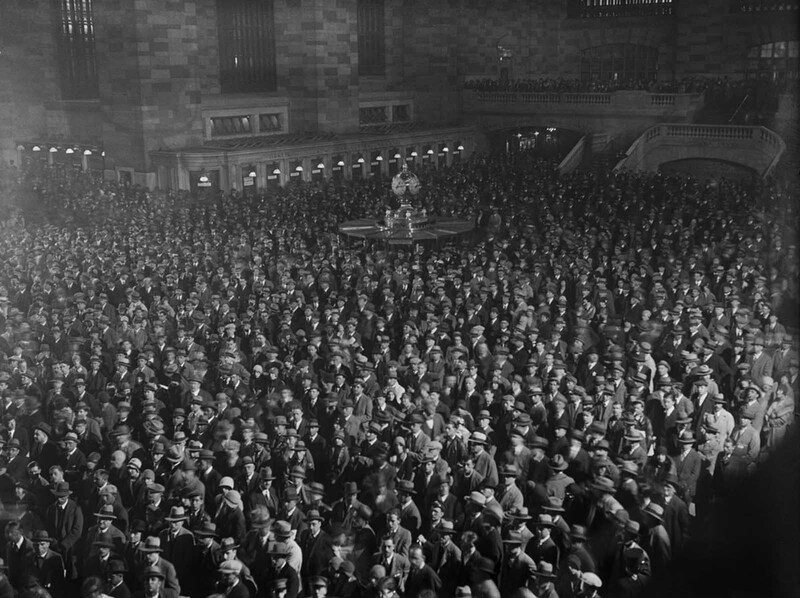 In 1947, more than 65 million people – the equivalent of 40% of the U.S. population – traveled through Grand Central Terminal. 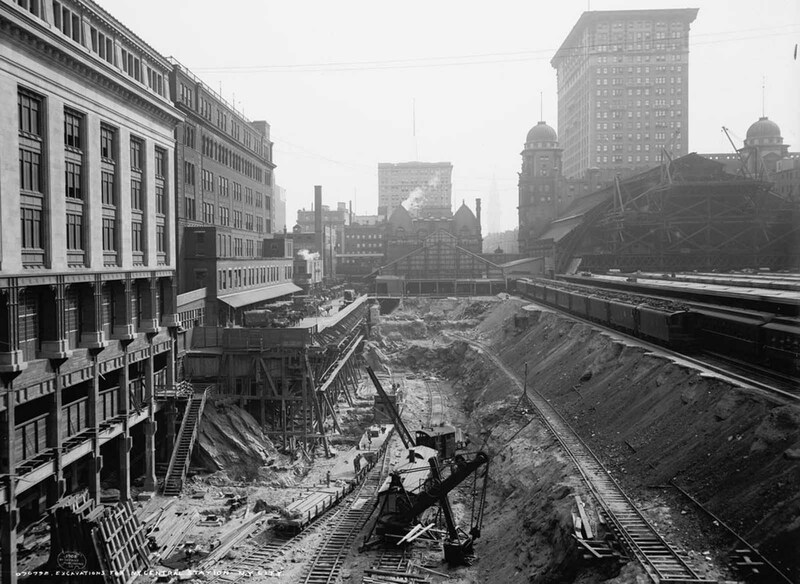 Excavations for the construction of Grand Central Station in New York City, in 1908. By the 1950s, the glory days of long-distance rail travel were over. In post-war America, many travelers preferred to drive or fly to their destinations. With the value of prime Manhattan real estate rising and railroad profits falling, the railroad began to talk about demolishing Grand Central Terminal and replacing it with an office building. 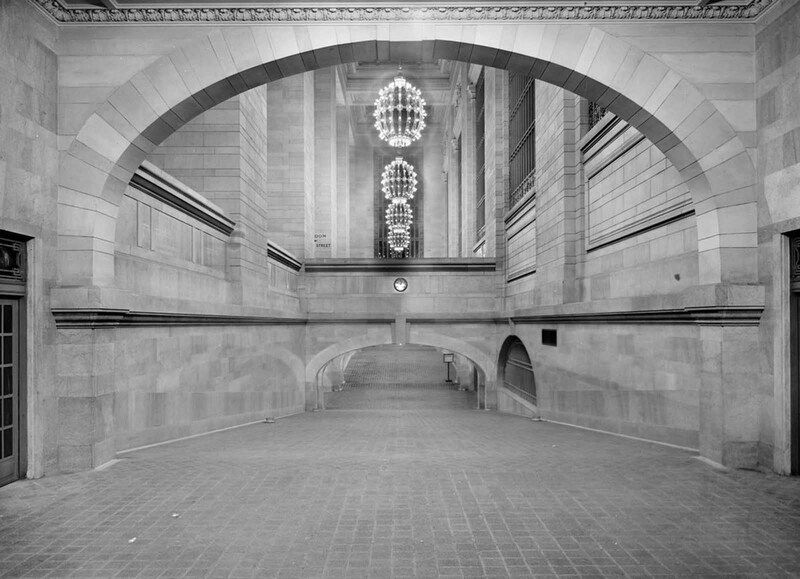 New York City’s new Landmarks Preservation Commission stepped in in 1967 to designate Grand Central Terminal as a landmark protected by law, temporarily squashing the development plans. Penn Central, the railroad conglomerate that owned Grand Central Terminal, did not want to take no for an answer. They proposed building a 55-story tower above Grand Central, which would have meant demolishing parts of the Terminal. The Landmarks Preservation Commission blocked the project, leading Penn Central to file an $8 million lawsuit against the City of New York. The court battle lasted for almost 10 years. Thanks to concerned citizens and city leaders, including Jacqueline Kennedy Onassis, the development plans were thwarted (after the lawsuit went all the way to the Supreme Court). 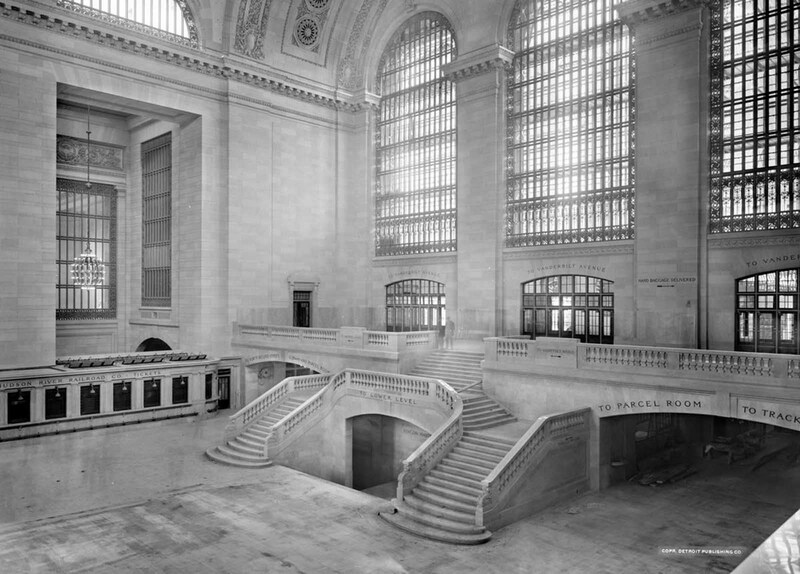 In 1994, Metro-North took over operation of Grand Central Terminal and began extensive renovations. Now restored to its 1913 splendor, Grand Central has become a beloved Manhattan landmark and a busy commuter hub. Grand Central preserves a little of the history and grandeur of old New York in the middle of modern Manhattan. 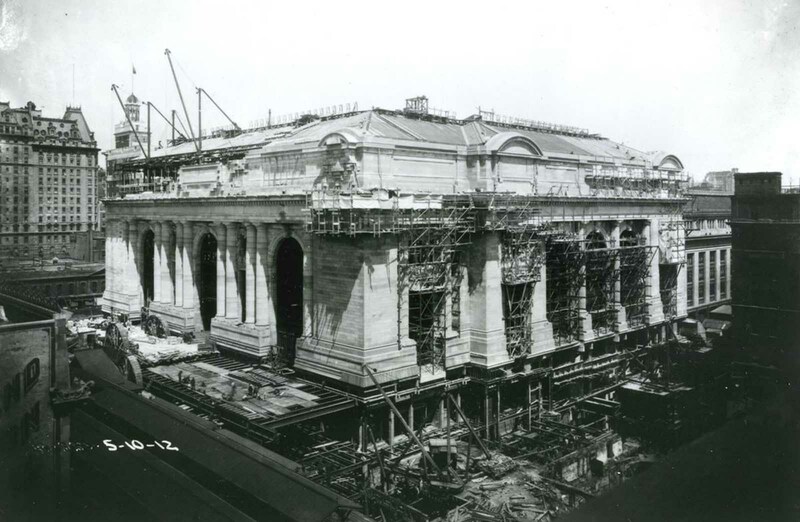 An exterior view of Grand Central Terminal under construction in New York City, on May 10, 1912. A view of the west balcony in Grand Central Station in New York in this photo taken between 1913-1930. Incline from subway to suburban concourse, Grand Central Terminal, New York, ca 1912. 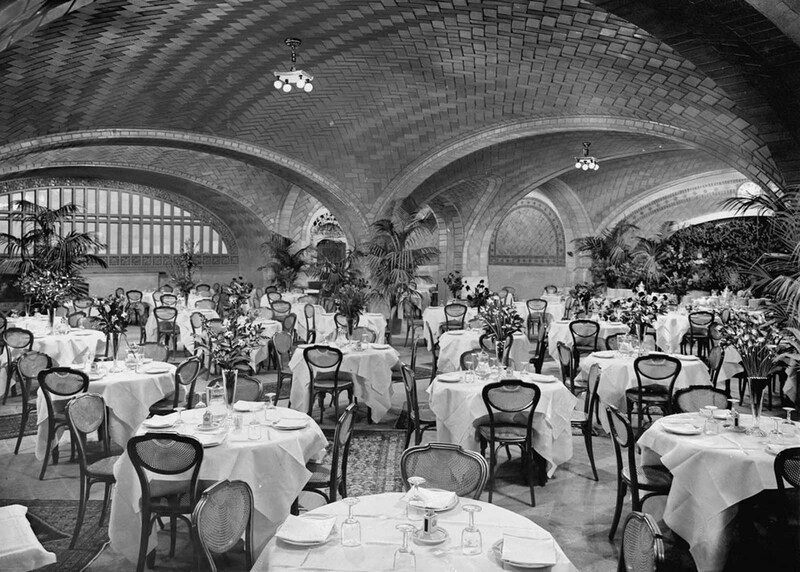 Restaurant, Grand Central Terminal, ca 1912. Men stand on an incline to suburban concourse, Grand Central Terminal, ca 1912. 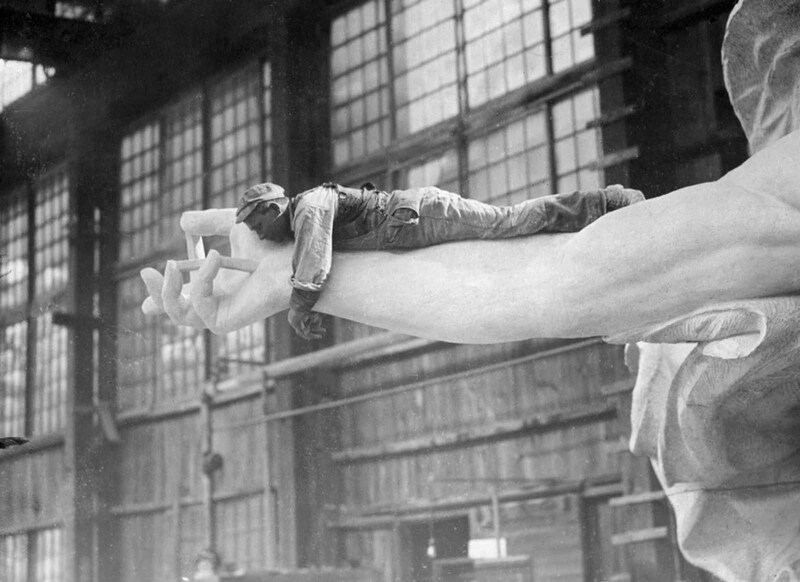 A workman lies atop the eleven-foot arm of Mercury, part of the statuary at Grand Central Station. 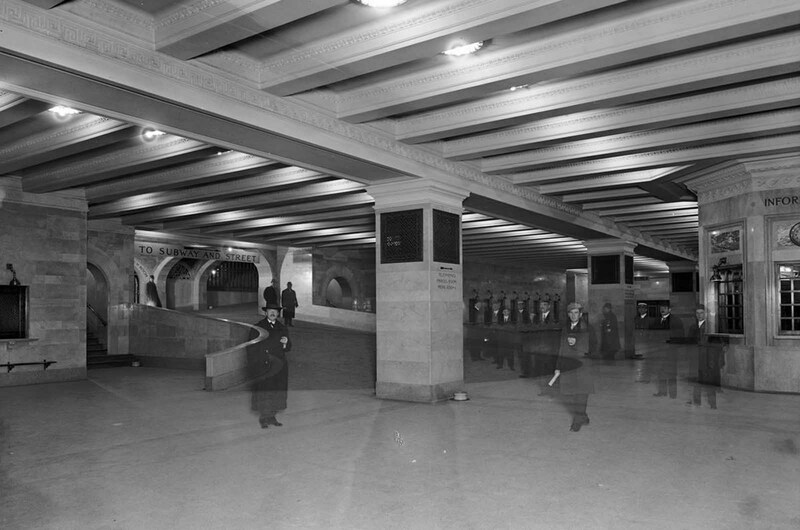 Suburban concourse with ramp, Grand Central Terminal, ca 1912. Grand Central Terminal, at Vanderbilt Ave and 42nd St., ca 1919. A crowd looks on as the “Bremen”, a German Junkers W33 aircraft, and the first plane to fly west across the Atlantic, is placed on display in Grand Central Terminal, on May 21, 1929. Grand Central Terminal at E. 42nd St. and Vanderbilt Ave. in New York City. 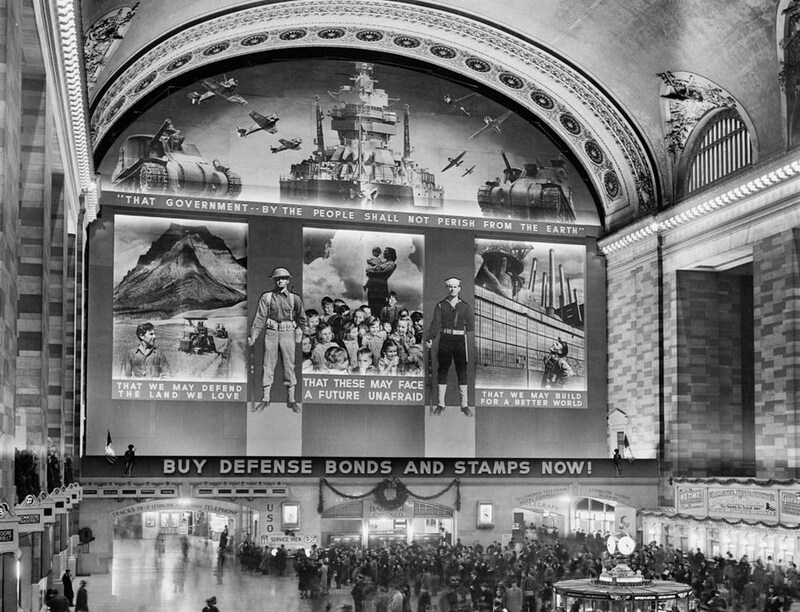 A massive photomural to promote the sale of defense bonds, designed by the Farm Security Administration, in the concourse of Grand Central Terminal, in 1941. 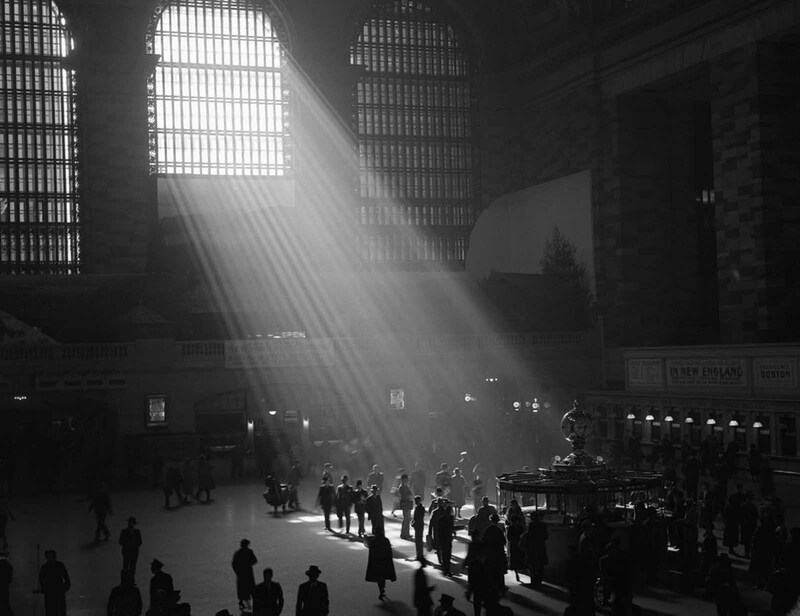 The interior of Grand Central Station, with the sun streaming in through the window. 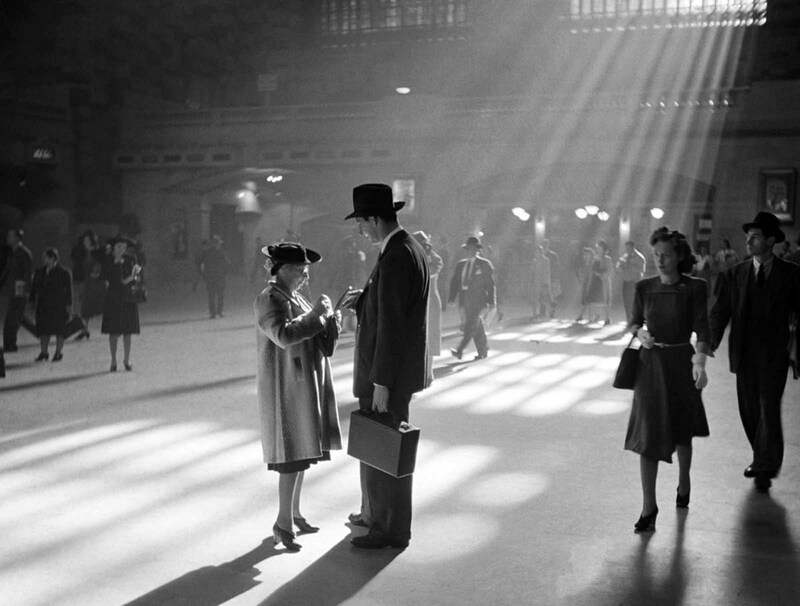 A man and woman talk together as people pass through the Main Concourse of New York’s Grand Central Terminal in Midtown Manhattan, in October of 1941. 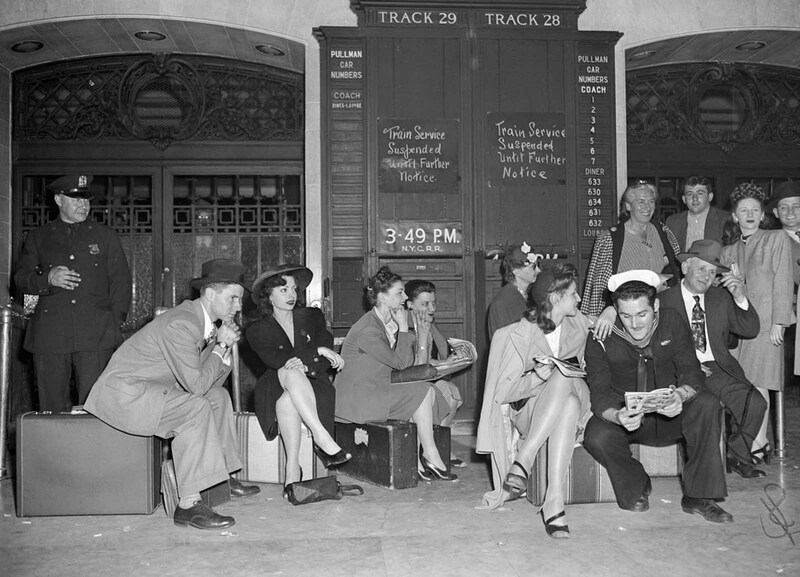 Would-be passengers sit on their luggage in Grand Central Terminal on May 23, 1946, where they were stranded by a rail strike. 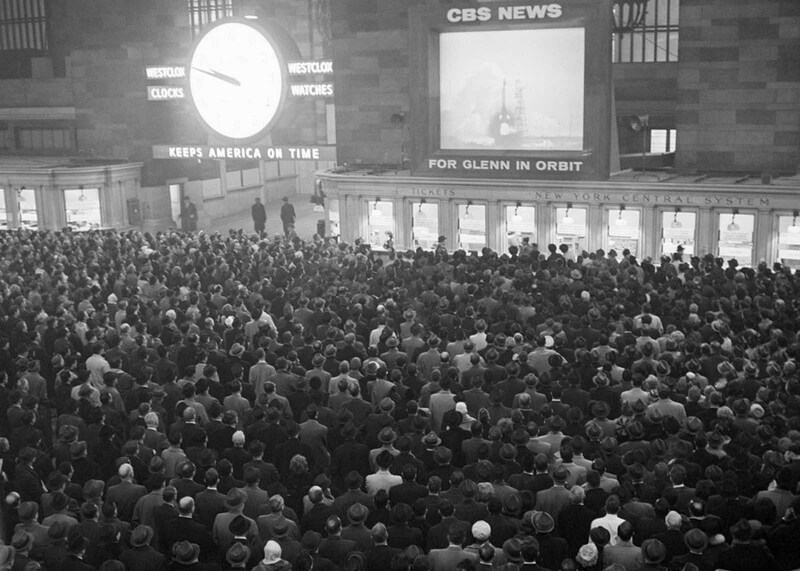 Some 5,000 workers watch the launching of astronaut John H, Glenn Jr. into orbit around the world on a huge television screen in Grand Central Terminal, on February 20, 1962. 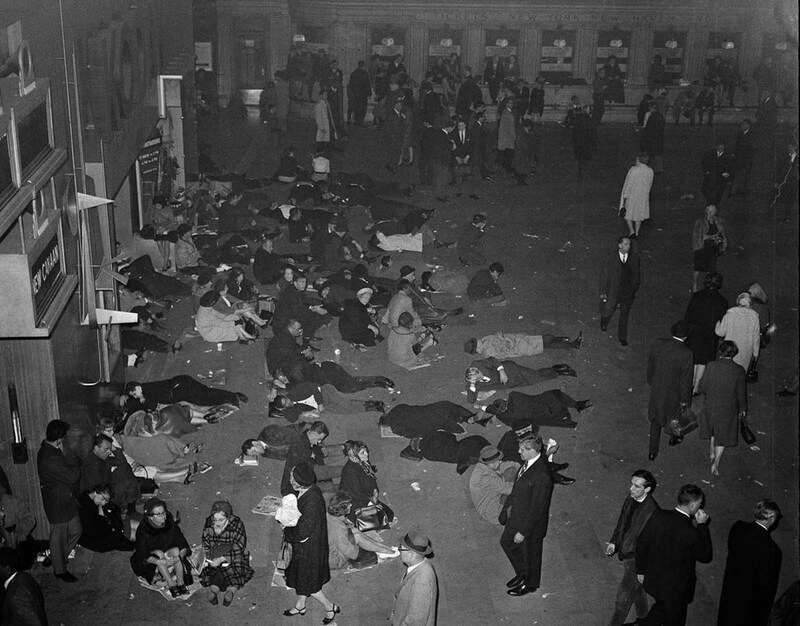 People sleep sitting and lying down at Grand Central Terminal’s main waiting room in New York, during a massive power failure, on November 9, 1965. The area is lit with emergency lighting. The blackout affected New York State, most of New England, parts of New Jersey, Pennsylvania, and Ontario, Canada. 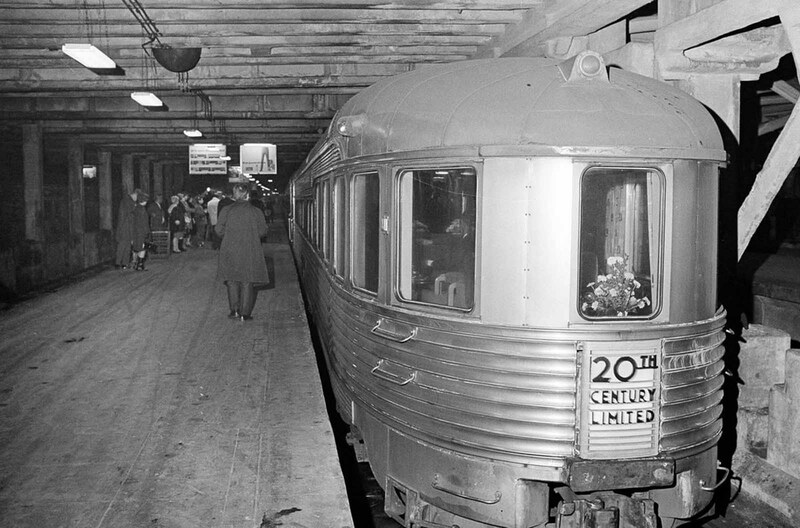 The 20th Century Limited gets ready to leave Grand Central Station in New York for its last run, on December 2, 1967. The 20th Century Limited was an express passenger train that ran between Grand Central Terminal and LaSalle Street Station in Chicago, operated by the New York Central Railroad from 1902 until 1967. 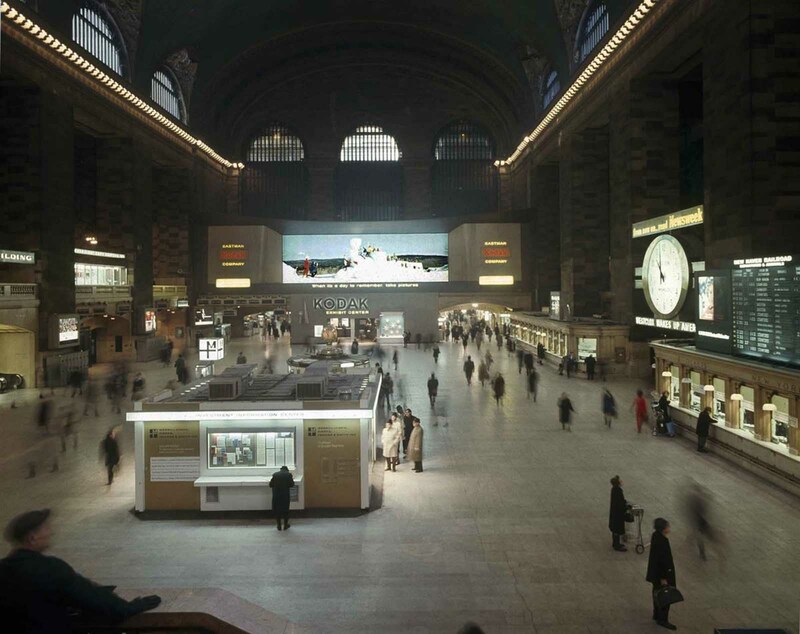 A general view of the interior of the grand concourse of New York’s Grand Central Terminal, shown some time after the morning rush hour, on January 9, 1968. The 59 stars shine as part of the backwards-painted zodiac set in gold leaf constellations span the ceiling of the main concourse of Grand Central Terminal in New York, January 25, 2013. 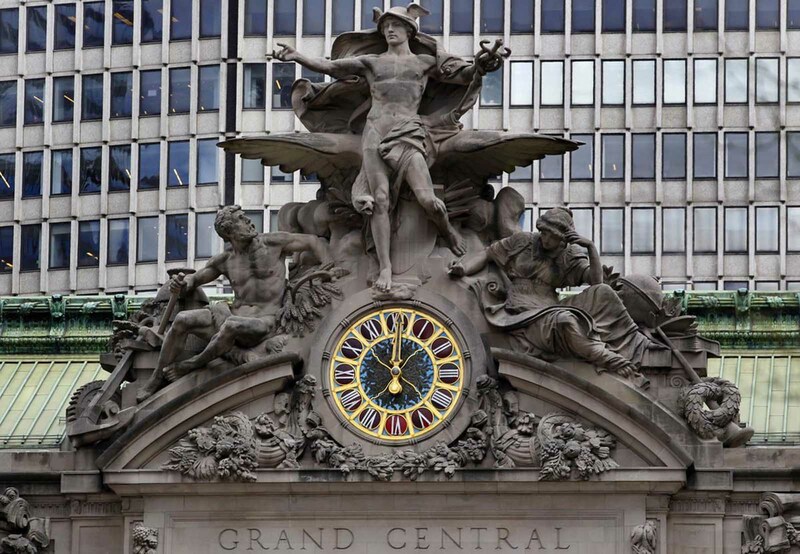 The clock on the south-facing side of New York’s Grand Central Terminal strikes noon, on March 29, 2012. The massive celestial ceiling that adorns the main concourse is depicted backwards. The mistake went unnoticed until a commuter—and amateur astronomer—pointed it out. The true reason for the mistake has never been uncovered, and theories vary. Some believe the ceiling’s designer accidentally transposed the original source, while others–including the Vanderbilts themselves–claimed that it was a purposeful depiction of God’s unique vantage point of the stars. 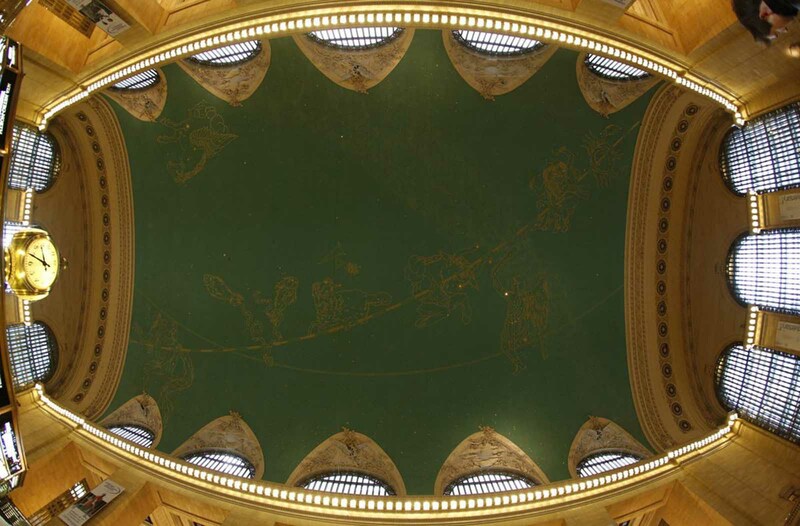 The original ceiling was replaced in the 1930s, but the “mistake” remained, though for many years most New Yorkers couldn’t have seen it if they tried—the entire surface was covered in grime and dirt. It wasn’t until the 1980s that a restoration project began to remove the gunk, long thought to have been caused by the arrival and departure of thousands of trains. In fact, it was man—not machine—that caused the damage, which was the result of millions of cigarettes smoked by waiting commuters. (Photo credit: AP Photo / Library of Congress).